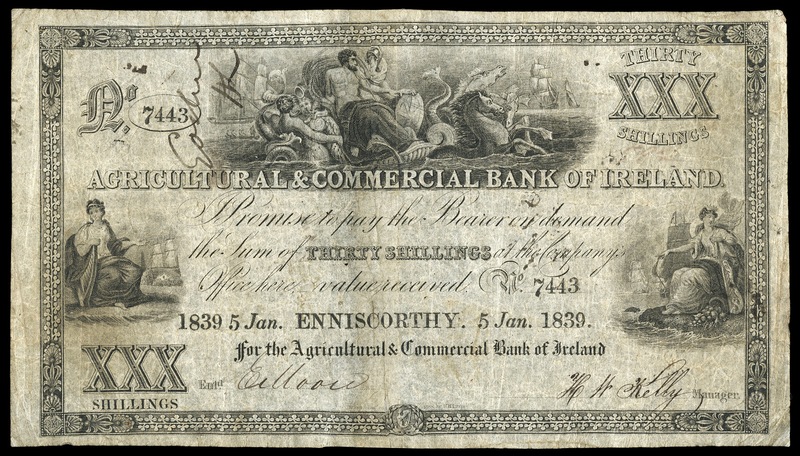 The short-lived Agricultural & Commercial Bank of Ireland was founded in 1834, suspended payments in 1836 and struggled on until 1840. It was the first Joint-Stock Bank in Ireland to fail but it was not its failure (in itself) that made headlines but the manner of its failure. When founded, in 1934, its initial funding of £5 million exceeded the combined ‘nominal capital’ of the other 4 banks (Northern Bank, Belfast Bank, Hibernian Bank and Provincial Bank) operating in Ulster by over £1 million. Their competitors shares were valued at over £100 each, whereas the new Agricultural & Commercial shares were valued at £5 each – thus allowing (smaller) investors of modest means an opportunity to participate. Its publicity machine bragged that it would open 300 branches throughout the UK and they based their business plan on the model used by the Northern & Central Bank of England (also established in 1934) who had opened 40 branches its first year at £10 a share. Initially the Agricultural & Commercial opened branches throughout the south and west of Ireland. In these areas, it competed directly with the Bank of Ireland, the National Bank of Ireland and the Provincial Bank of Ireland but, since it’s publicity machine emphasis the ownership, share capital and management was coming from London for these three banks, the people of the south and west of Ireland were only too pleased to have a home-grown alternative, owned by small businessmen (artisans, farmers and the like). This tactic was redundant in Ulster where the Belfast Banking Company was locally owned, locally run and very much on the side of the small Presbyterian businessmen and very popular as a result. Instead of being locally run, it was decided to run any new branches in Ulster from Dublin. There was also a new rival in the guise of The Ulster Bank – who also opened at £10 a share. This gave additional confidence to the shareholders that the idea of £10 a share was not a problem, despite worries in London banking circles that a crisis similar to that of 1924 was about to happen again, i.e. a speculative boom that was about to crash. In Belfast, firms of local stockbrokers began to appear. By August, the Bank of England in London had raised its interest rate by 25% in an effort to quell a speculation ‘boom and bust’ scenario but the Bank of Ireland refused to follow – keeping its ‘discounted rate’ low, thus fueling local speculation. 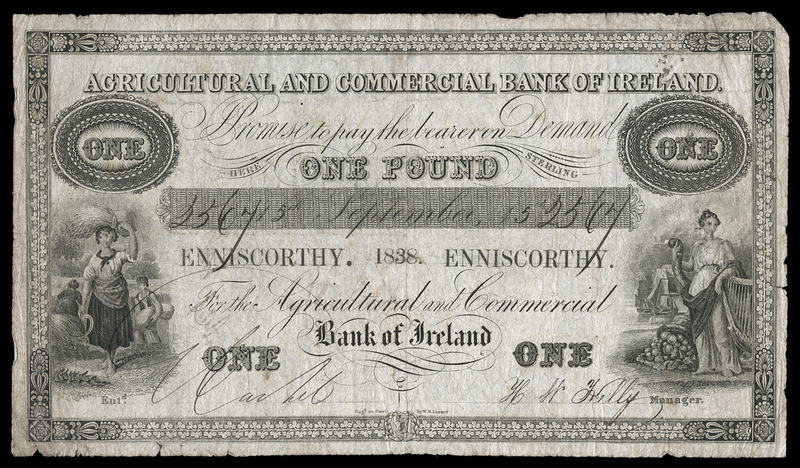 In October 1836, the Bank of Ireland suddenly raised its rate by 25% (matching the Bank of England rate) in response to the publication of the Agricultural & Commercial’s balance sheet. Although there were doubts about the solvency of Agricultural & Commercial for several months, these were largely ignored by shareholders and investors who could only see huge potential ‘paper profits’ in the near future. Many small investors could not even afford to travel to Dublin for the E.G.M. The 1840s were a disaster for Ireland – both north and south. And then, the Great Potato Famine arrived !